Feeling magical in front of Cinderella’s castle. “Welcome to the happiest place on earth,” I said to my wife through gritted teeth. We were pressed shoulder-to-shoulder in a packed mass of humanity, waiting to get off the ferry to the Magic Kingdom. It was our second trip back to the park that day. We were all tired, but we (mostly my wife and I) wanted to see the park at night. My eight-year-old daughter wanted to ride Space Mountain again. But it had been a hard day. My son needed a haircut, and one of the Magic Kingdom guidebooks (The Idiot’s Guide To Disney World) suggested stopping at the Harmony Barber Shop on Main Street for a trim. We did, but my son had a meltdown in the chair. 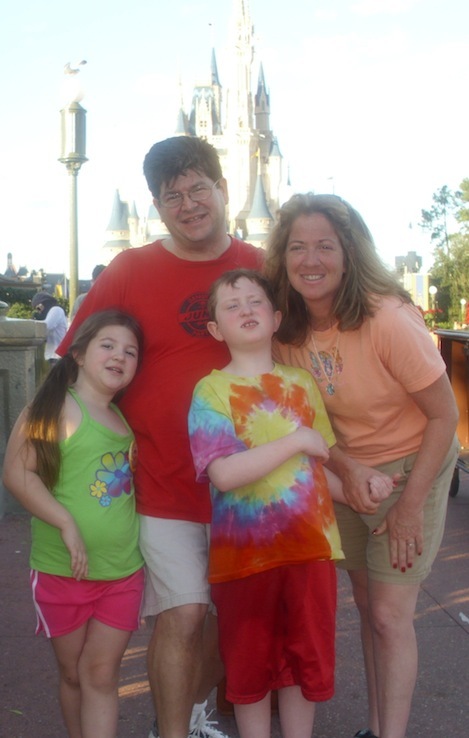 While this is not uncommon for a kid with autism, it’s not the way you want to spend your day at Disney. (That’s what I get for following The Idiot’s Guide!) Luckily the patient and skilled stylist (the aptly named, Orlando) worked through it, and gave Rocco one of the best haircuts of his life. My daughter had troubles, too. She was unimpressed with some of the rides, especially the Haunted Mansion, and It’s A Small World. “That was my favorite ride when I was a kid! Grandma’s, too!” My wife was incredulous. My daughter’s sulky pout earned her a mini-lecture about being more appreciative. The sign at the entrance to Disney says, “Let the memories begin!” and we generated quite a few during our visit. We had breakfast with Mickey and friends, and we hit every ride at the Magic Kingdom and Epcot (several more than once). We saw pirates and princesses, rode a jungle boat and spaceships, visited Mars and a high-speed test track, ate pricey ice cream and chicken tenders and watched tourists gnaw on giant turkey legs. We toured the world in miniature, stucco, and animatronic replication. We rode countless buses, boats, and monorails. One shuttle bus trip was so lengthy, a little boy had to jump off at a red light so he could pee in the manicured hedges. For obvious reasons, this is my daughter’s most vivid memory, and one she’s eager to share with others when they ask about her Disney vacation. The entrance to the Magic Kingdom that night was as crowded as the ferry boat that brought us there. We locked hands and wove down Main Street, following the route of the Electrical Parade. We pressed on, and the crowd thinned by the time we reached Tomorrowland. We caught our breath, and enjoy the sight of Disney after dark as we cruised around on the PeopleMover. 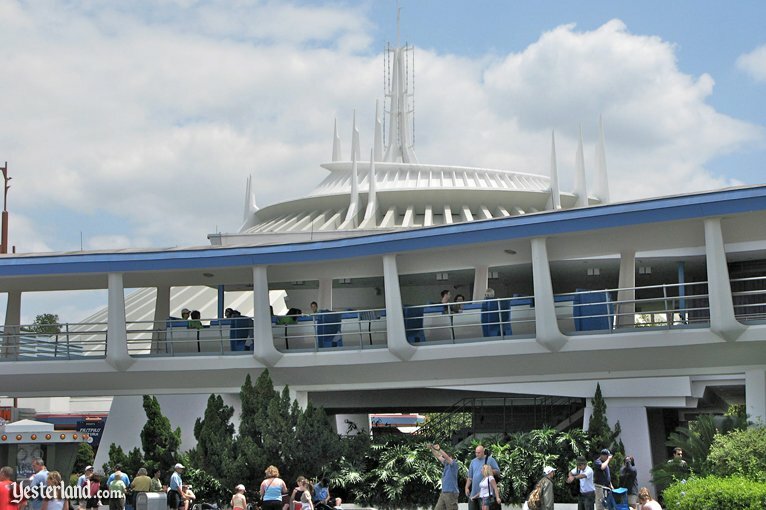 My daughter and I rode Space Mountain twice, and then I found my wife and son sitting on a bench, staring up at Cinderella’s Castle. They both looked dazed and dreamy. 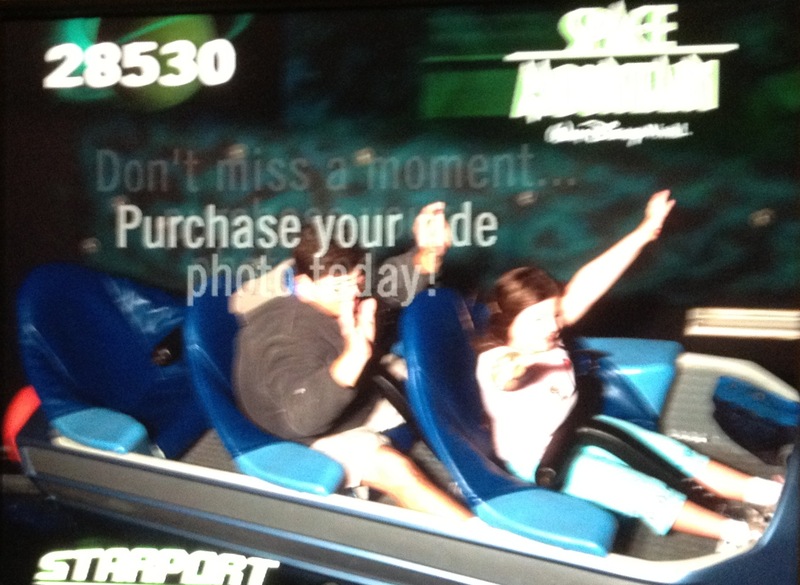 My daughter and I ride Space Mountain. I cheaped out on the official photo and took this picture of the sample screen instead. “You just missed the most awesome fireworks display I’ve ever seen,” my wife said. 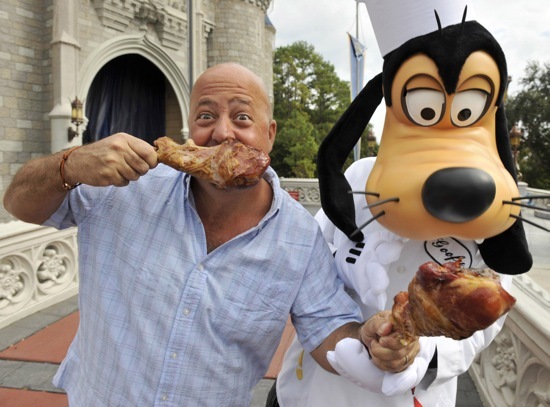 Another fine Disney memory is born…right up there with peeing in the bushes at a red light.